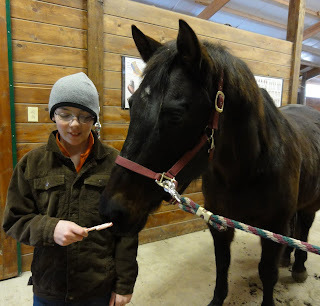 You know your kid is horse crazy when they beg you to go to the barn to see and brush the horses on a non-riding day. And we brought along some left over candy canes that Belle quickly gobbled up! Four days of drinking only fresh fruit and veggie juice is finally over. We juiced carrots,kale,parsley,tomatoes,red peppers,jalapeno peppers,spinach,limes,lemons,apples,pears,leeks,cabbage,swiss chard,grapefruit,cranberries,celery,oranges,kiwi,pineapple,blueberries,black berries, and even a sweet potato!! I thankfully didn't have any digestion issues but my blood sugar was all over the place. One minute I felt fine and the next I was sweating and shaking. I felt like I was in a fog the entire detox and couldn't think clearly. The only plus was losing 8 pounds but I wasn't doing it for the weight loss. I will never, ever try this again. I will definitely add fresh juice as a supplement to my diet as it's a great way to get extra veggies. I planned a whole week of vegan dinners with recipes from my new cookbook,Appetite for Reduction. Tonight's dinner of Mango BBQ beans over brown rice with corn and scallion cornbread was a hit with the whole clan. 2012 is off to a healthy start! !